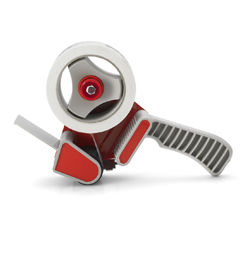 You will find a wide variety of packing/packaging tapes in this section. We import and distribute a wide range of brown Polyprop packing tapes, clear packing tapes, 1â€ tape (sellotape), low noise tapes, printed tapes (e.g.. Fragile tape), strong vinyl tapes, colored tapes, bonus tapes, masking tapes, double sided tapes, cross weave reinforced tapes, industrial tapes, and many more. Our recommendation for most businesses would be the Cellofix branded low noise clear and brown Polyprop tapes. These are imported directly from Greece, and made with a special glue to provide extra adhesion and ensure noise levels are kept to a minimum. They are designed specifically for business / warehouse / industrial use, hence are stronger than the average tape available in the market â€“ you will find that the roll lasts a lot longer, as you use less of it, even though they are the standard 66 metre length.